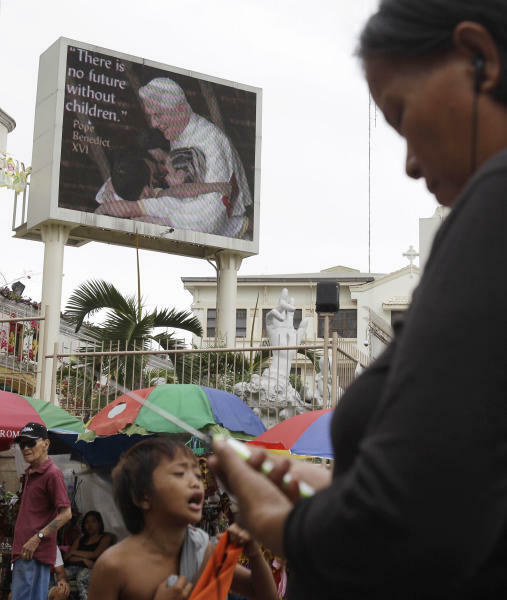 MANILA, Philippines (AP) — Twenty-six years after Roman Catholic leaders helped his mother marshal millions of Filipinos in an uprising that ousted a dictator, President Benigno Aquino III picked a fight with the church over contraceptives and won a victory that bared the bishops' worst nightmare: They no longer sway the masses. Aquino last month signed the Responsible Parenthood and Reproductive Health Act of 2012 quietly and without customary handshakes and photographs to avoid controversy. 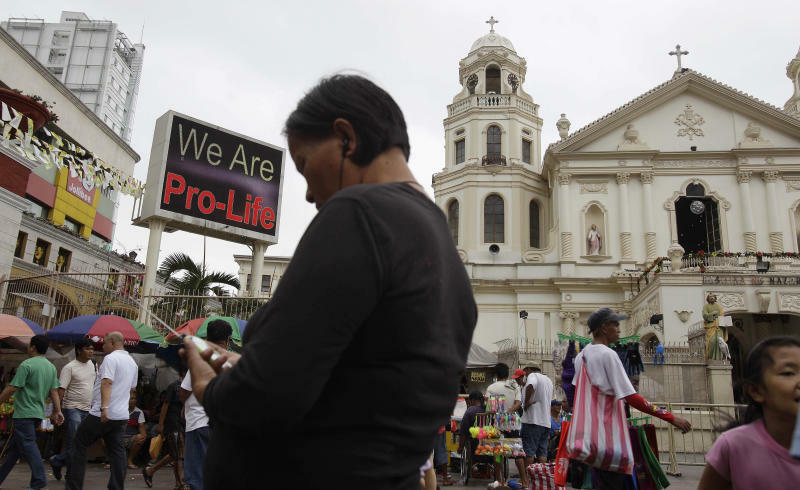 The law that provides state funding for contraceptives for the poor pitted the dominant Catholic Church in an epic battle against the popular Aquino and his followers. A couple with links to the church filed a motion Wednesday to stop implementation of the law, and more petitions are expected. Still, there is no denying that Aquino's approval of the legislation has chipped away at the clout the church has held over Filipinos, and marked the passing of an era in which it was taboo to defy the church and priests. Catholic leaders consider the law an attack on the church's core values — the sanctity of life — saying that contraceptives promote promiscuity and destroy life. Aquino and his allies see the legislation as a way to address how the poor — roughly a third of the country's 94 million people — manage the number of children they have and provide for them. 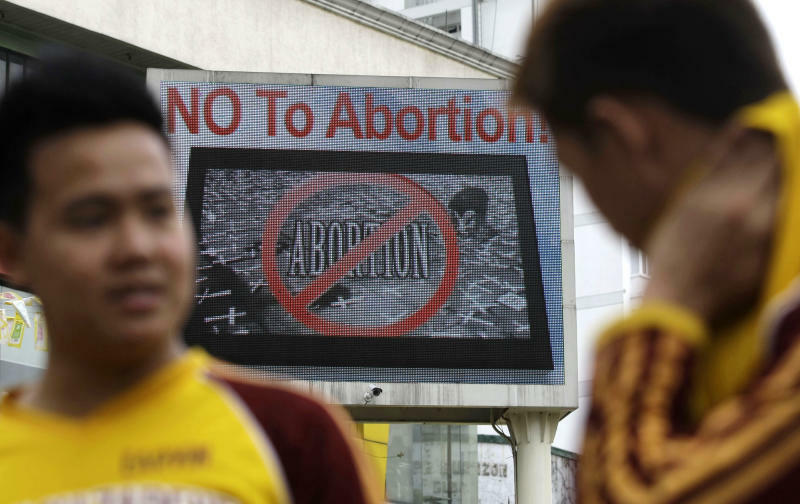 Nearly half of all pregnancies in the Philippines are unwanted, according to the U.N. Population Fund, and a third of those end up aborted in a country where abortion remains illegal. Rampant poverty, overcrowded slums, and rising homelessness and crime are main concerns that neither the church nor Aquino's predecessors have successfully tackled. "If the church can provide milk, diapers and rice, then go ahead, let's make more babies," said Giselle Labadan, a 30-year-old roadside vendor. "But there are just too many people now, too many homeless people, and the church doesn't help to feed them." Labadan said she grew up in a God-fearing family but has defied the church's position against contraceptives for more than a decade because her five children, ages 2 to 12, were already far too many for her meager income. Her husband, a former army soldier, is jobless. She said that even though she has used most types of contraceptives, she still considers herself among the faithful. "I still go to church and pray. It's a part of my life," Labadan said. "I have prayed before not to have another child, but the condom worked better," she said. The law now faces a legal challenge in the Supreme Court after the couple filed the motion, which seems to cover more ideological than legal grounds. One of the authors of the law, Rep. Edcel Lagman, said Thursday that he was not worried by the petition and expected more to follow. "We are prepared for this," he said. "We are certain that the law is completely constitutional and will surmount any attack on or test of its constitutionality." Over the decades, moral and political authority of the church in the Philippines is perceived to have waned with the passing of one its icons, Cardinal Jaime Sin. He shaped the role of the church during the country's darkest hours after dictator Ferdinand Marcos imposed martial law starting in 1972 by championing the cause of civil advocacy, human rights and freedoms. Sin's action mirrored that of his strong backer, Pope John Paul II, who himself challenged communist rulers in Eastern Europe. Three years after Aquino's father, Benigno Aquino Sr., a senator opposing Marcos, was gunned down on the Manila airport tarmac in 1983, Sin persuaded Aquino's widow, Corazon, to run for president. When massive election cheating by Marcos was exposed, Sin went on Catholic-run Radio Veritas in February 1986 to summon millions of people to support military defectors and the Aquino-led opposition. Marcos fled and Aquino, a deeply religious woman, was sworn in as president. Democracy was restored, but the country remained chaotic and mired in nearly a dozen coup attempts. The economy stalled, poverty persisted and the jobless were leaving in droves for better-paying jobs abroad as maids, teachers, nurses and engineers. After Aquino stepped down, the country elected its first and only Protestant president, Fidel Ramos. He, too, opposed the church on contraceptives and released state funds for family planning methods. Catholic bishops pulled out all the stops in campaigning against Ramos' successor, popular movie actor Joseph Estrada, a hero of the impoverished masses who made little attempt to keep down his reputation for womanizing, drinking and gambling. But few heeded the church's advice. Estrada was elected with the largest victory margin in Philippine history. Halfway through his six-year presidency, in January 2001, he was confronted with another "people power" revolt, backed by political opponents and the military, and was forced to resign. His successor, Gloria Macapagal Arroyo, styled herself as a devout Catholic and sought to placate the church by abolishing the death penalty and putting brakes on the contraceptives law, which languished in Congress during her nine years in power. It mattered little. Arroyo's mismanagement and corruption scandals set the stage for Aquino's election on a promise to rid the Philippines of graft, fix the economy and lift millions out of poverty. The scion of the country's democracy icon took power several years after Sin's death, but it was a different era in which the church was battered by scandals of sexual misconduct of priests and declining family values. The latest defeat of the church "can further weaken its moral authority at a time when this is most badly needed in many areas, including defense of a whole range of family values," said the Rev. John J. Carroll, founding chairman of the Jesuit-run John J. Carroll Institute on Church and Social Issues. He said he wondered how many Catholics have been "turned off" by incessant sermons and prayers led by the church against the contraceptives law, and how much it contributed to rising anticlericalism and the erosion of church authority. "People today are more practical," said Labadan, the street vendor. "In the old days, people feared that if you defy the church, it will be the end of the world." Associated Press writers Jim Gomez and Teresa Cerojano contributed to this report.